The B330 is an inflatable module that may someday enable humans to live and work in orbit around the moon, and even on Mars. The endeavor belongs to Bigelow Aerospace, a company that is now working with the United Launch Alliance (ULA) to get their inflatable lunar orbit station into space. Bigelow Aerospace has had previous success launching inflatable units beyond Earth’s atmosphere. The company created BEAM (Bigelow Expandable Activity Module), which was added to the International Space Station (ISS) in 2016, extending the station’s living space after an easy set up. Other advantages that include durability and a compact, lightweight structure that lends itself well to transport aboard a cargo capsule. B330, the newest module, could be launched into low lunar orbit as soon as 2022 after hitching a ride on ULA’s Vulcan 562 rocket. This module is larger than BEAM, offering 330 cubic meters of volume—about a third of the size of the ISS. It’s spacious enough to accommodate a crew of six. 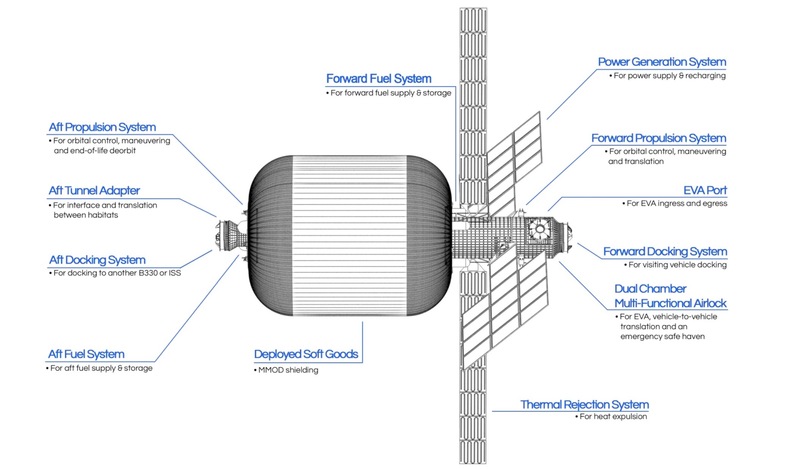 Once B330 enters orbit around the moon, Bigelow Aerospace will outfit the habitat and ensure that it’s fully functional. It may then serve as a base for future Moon-based developments and as a training and research location for astronauts and long term space exploration prep. ULA and Bigelow Aerospace’s partnership on this endeavor—sometimes called “the lunar depot”—could be a springboard into more ambitious plans for returning to the Moon. While NASA has expressed interest in merging its own lunar exploration plans with Bigelow Aerospace and ULA, it’s not yet clear if, or how soon, funding for a return to the Moon will be available. What are your thoughts on this concept? Tell us what you think in the comments.